Flower power, Merseybeat, Mods, mini skirts and The Twist . . . All these things are now recognised cult icons of the Sixties, but nothing can have been more representative of the spirit of Sixties youth and its rebellion against the unwillingness of the old-fashioned 'establishment' to accept their new ideals than 'pirate' radio. 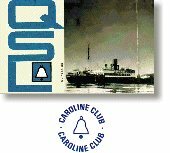 The names and sounds of the major stations like Radio Caroline and 'Big L' - Radio London - are very well known but how much do you really know of their fascinating history, the many smaller, less well-known stations, and their epic struggle to break the stranglehold of outmoded industry bureaucracy in order to bring the vibrant new sounds of rock to a new generation? This short history and accompanying pages contain the most accurate information I can find, or extrapolate, and is derived from a large number of sources. Not unsurprisingly many accounts are contradictory and, where I have found this to be the case, I have taken the point of greatest consensus. For this reason I can't take any responsibility for the (hopefully few) inaccuracies but I would, of course, be absolutely delighted to change any incorrect statements if you would take the trouble to email me and substantiate it with some documented or verifiable evidence. The list of Disc Jockeys is, I am sure, considerably larger than the one I have assembled. If you can help add to it I would be happy to get an e-mail from you, likewise any information about the offshore forts. Lastly, the history strays slightly either side of the Sixties. It seemed a shame not to document it from the start as it was so close to the Sixties, neither did it end in 1969 - Pirate Radio lives on! The Home Service (which was Radio 4 style), The Third Programme and Network 3 (Radio 3 style) and the Light Programme (Radio 2 style). The first two entertained the middle-aged, middle and upper-class audiences with various types of programme and comedy offerings like The Clitheroe Kid, together with more classical and traditional music programmes which did not particularly appeal to the new youth culture. The Light Programme was the only one that made even a token attempt at youth programming, offering mainly trad jazz and skiffle, but was generally hosted by presenters who were uncomfortable with the material. BBC music entertainment shows in the late Fifties and early Sixties consisted of such offerings as 'Worker's Playtime', 'Pop Inn', '12 O'Clock Spin' and the slightly more youth-oriented 'Drumbeat' and 'Go Man Go' - "your Friday tonic, the show with the most". The latter was presented by 'your swinging man Friday' David Ede and was broadcast live from the BBC Playhouse in London, featuring resident session bands such as Bob Millar and His Millarmen, Arthur Greenslade and The G-Men, and Colin Day and The Hound Dogs who played a half-and-half mixture of 'pop' music and standards. Both of these shows originally entertained a live studio audience and Drumbeat even contained an early version of 'Juke Box Jury'. The BBC did make a couple of minor concessions to the new music culture with a programme on Saturday mornings called 'The Saturday Skiffle Club' (later to drop the 'Skiffle') and a review of the singles record chart on Sunday afternoons (although more short-lived shows were eventually added at various times during the Sixties to try and compete with the emerging 'pirate' phenomenon). 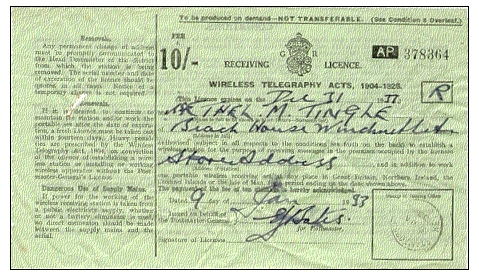 A separate radio licence was required if you had a radio but no television. Also, a separate radio licence was required if you had a radio in your car. This was finally abolished in 1971. Even in this, the shows were hosted by presenters, like Don Moss, who were more used to the usual BBC output, making the end result rather uninspired. Things improved slightly in 1961 when Alan 'Fluff' Freeman took over Sunday's 'Pick Of The Pops' slot from the more sedate David Jacobs but his upbeat style was not particularly to the taste of the corporation management and he was not infrequently requested to 'tone it down'. The following year saw another programme called 'Teenager's Turn - Here We Go' on which The Beatles made their radio debut in March 1962. There were few alternatives, the best of which was probably in frequenting one of the multitude of small coffee bars with the obligatory jukebox that sprang up ever faster around this time although they were not a new phenomenon. Other than that there were the 'listening booths' at your local record shop or, if you happened to live near the east coast, you could try tuning your wireless to Radio Luxembourg which was coming in from across the North Sea on 208 metres medium wave. The only snag being that the signal fluctuated a lot and it could only be received between about 7p.m. and 3a.m. Some shows frequently heard were a Merseybeat feature called 'Saturday Night at The Cavern' and a programme called 'Swingtime' which went out on Sundays at about 9 p.m. It was from Luxembourg that Keith Fordyce introduced us to the 'power play'. The major record companies such as Decca, Columbia, Philips, Capitol, Warner Brothers and E.M.I. paid huge amounts of money to sponsor 15 or 30 minute time slots on the station and because of this generally only the first 30 seconds or so of a record were played, linked by a 'live' disc jockey doing quick intros, in order to get as many of their artists and new records as possible into the time allocation. This was sometimes as high as 13 or 14 records crammed into a 15 minute 'slot'. Many of the shows were pre-recorded at London's Hertford Street studios and a typical night's programming consisted of 30 minutes of singles, 30 minutes of L.P. tracks followed by lighter music until 'Music In The Night' came on at midnight, catering to a much wider selection of musical tastes. On Sundays at about 11p.m. Barry Aldis hosted a 'Top 20' show. The station also produced its own weekly magazine, 'Fabulous 208', a feature which was to be emulated by the major offshore 'pirates'. The early Sixties saw mainland Europe address the lack of youth-oriented shows in their own countries by setting up privately-owned offshore 'pirate' radio stations to broadcast the music that they wanted to hear, transmitting unlicensed broadcasts from ships anchored outside territorial waters. 1960 saw the launch of Radio Veronica and, within a few years, it was followed by Radio Nord, Radio Mercur and Radio Syd who covered some Scandinavian countries. Belgium had Radio Antwerpen for a short while and Radio Veronica, soon joined by Radio Nordzee, was belting it out to the lowland countries from off the coast of Holland. This was great for the mainland of Europe but the signal strength these stations generated wasn't high enough to reach over here with the exception of Radio Veronica which could sometimes be picked up on the east coast when conditions permitted. With the B.B.C. failing to cater adequately for the new 'beat generation' and the limited reception quality from the European stations the only apparent (some would say obvious) solution was for someone to start a brand new station a bit nearer to home. At the start of the Sixties there had been some considerable pressure on the British government to issue licences to land-based commercial stations but none seemed to be forthcoming. One of the more persistent lobbyists was T.H. Colbourn who was a member of the Manx parliament, Tynwald, and whose radio and television company serviced a large proportion of the island's communications. Another major supporter was Sir Ronald Garvey, the island's Lieutenant-Governor, who had been instrumental in setting up a local radio station in his time as Governor of Fiji. Technically, Manx Radio did not need a broadcasting licence from the UK authorities as it was a Crown Dependency and not part of the United Kingdom, but after two years of negotiations with the Home Office and other bodies success was finally achieved when the G.P.O. agreed to issue a licence for a local station which could only be heard within the confines of the island. The telecommunications company PYE were to build the station but it was still forced, by the licence conditions, to use a VHF transmitter even after an earlier offer of a medium-wave frequency of 1594 kilocycles had been rejected on technical grounds. The man employed to manage the station was Richard Meyer who had previously been manager of the International Broadcasting Company (which had organised the start of Radio Luxembourg before World War II) and the commercial manager of Associated television (ATV). From the outset he was less than enthusiastic about using VHF as there were comparatively few receivers for this medium around at the time. Nevertheless, test transmissions were carried out initially on VHF, the first broadcast being a commentary on the Isle of Man T.T. of 5th June 1964. The station continued throughout the summer in stereo on FM 89.0 MHz. Manx Radio officially became Britain's first licensed commercial radio station when regular transmissions began on November 23rd/24th using the frequency which had been previously rejected. Power was severely limited, by licence, to a mere 50watts! The operation began from a caravan situated on a hillside at Onchan Head, just outside Douglas which, according to their own website " ... being situated on a headland and exposed to high winds the station was prone in those days to needles skidding off records and the occasional bout of staff sickness from the rocking motion!" 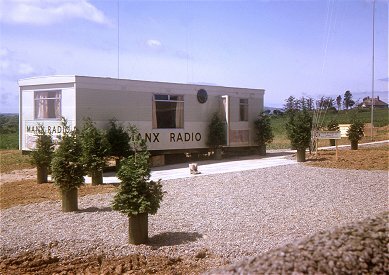 Manx Radio relocated the transmitting station to a permanent building at Foxdale in the centre of the island in 1965 while keeping the main offices on Douglas seafront. At this time an extension of the licence was granted allowing the station to broadcast on 232 metres (1295 KHz) during daylight hours and on 188 metres at night with a power of 2kW that actually enabled it to be heard over a large part of northern England. Despite this, the station's controllers still had ambitions of reaching a larger audience with a more powerful transmitter which caused a great deal of ill feeling between Tynewald and Westminster. The result of this was that the island had a much better relationship with a potential rival, the recently arrived Radio Caroline North, than it did with the BBC. The two stations co-existed quite happily side by side, with Manx Radio retaining the aspect of a local station, providing an information service to the island, while the more powerful transmitter used by 'Caroline', and its bigger audience, helped to achieve the island's aim of increasing tourism. 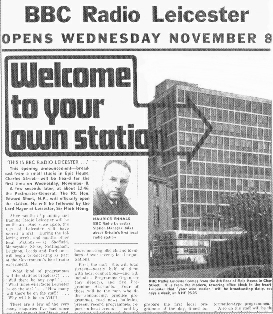 Also in October 1965 Radio Luxembourg had a new medium wave transmitter installed that meant improved reception on 208 metres for the station in the U.K. A Gallup Poll during the year had put its estimated listening audience at 37 million. Up until 1967 the broadcasting of 'pop' music had been almost completely confined to the various pirate radio stations. The Marine Offences Act of 1967 was responsible for the shutdown of most of these, every one having stopped broadcasting by 14th August 1967 except Radio Caroline Nth and Sth. As if finally realising the size of the potential audience that it had been ignoring, the BBC completely revamped its setup, announcing its future plans in December 1966. The Home Service became Radio 4, The Third Programme and Network 3 became Radio 3 and The Light Programme became Radio 2 on long wave. Light programme closedown. With these changes on 30th September 1967, along came a brand new BBC radio station accompanied by a huge amount of pre-publicity that took up where the pirate stations had left off - Radio 1 was born. The first voice heard, which announced ". . . and welcome to the exciting sound of Radio 1..." was, ironically, that of Tony Blackburn who had previously worked for both Radio Caroline and Radio London. His opening announcement was followed by The Move's 'Flowers In The Rain' (full playlist), the station broadcasting for 5 hours and 35 minutes on its first day, combining with Radio 2 in the evening. Radio 2 was first introduced by Paul Hollingdale. The Record Controller, Robin Scott said of it "It's not bash-bash-bash and nothing but the harsh, strident, way-out thing. We hope that it will have more than a teeny-bop audience. It would be absurd to have just a teeny bop network". The first-day schedule on Radio 2 was: 05.30 Paul Hollingdale, 08.32 Leslie Crowther, 10.00 Max Jaffa and Sandy MacPherson 'Melody Time', 12.00 Marching and Waltzing, 13.00 Jack Jackson, 14.00 Chris Denning, 15.00 Pete Murray, 16.00 Pete Brady, 17.30 Country Meets Folk, 18.32 Those Were the Days, 19.35 Million Dollar Bill, 20.15 Spotlight 1 and 2, 21.15 Caterina Valente Sings, 22.00 Pete Murray, 00.00 Sean Kelly. The George Martin composition 'Theme One' was initially used as the signature music for both Radio 1 and 2 and but soon replaced on Radio 2 with a jingle that emphasised 'easy' listening. Radios 2 and 1 often shared frequencies when the same programme was on both stations. 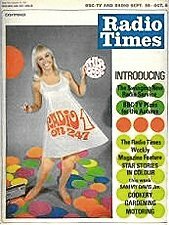 Radio 1 initially employed about 33 disc jockeys (or 'presenters' as they were known) of which more than half were ex-pirates, many of whom had already transferred to the BBC's Light Programme. 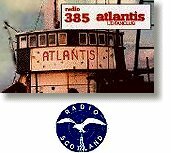 Radio London provided 11, Radio Caroline 4 plus Radio Scotland's Stuart Henry and Mike Raven of Atlanta, King and 390. 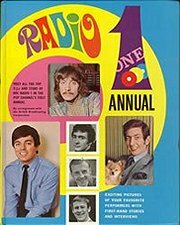 With a large proportion of them having worked previously on Radio London there was a tendency for Radio 1 to have the same style of presentation, even down to the sound of the jingles. 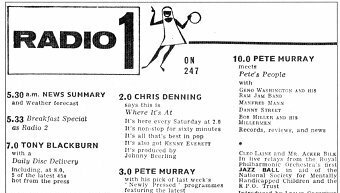 The 'senior' disc jockeys were 'big 4' Pete Murray, Alan Freeman, Jimmy Savile and David Jacobs, other presenters including Jimmy Young, Keith Fordyce, Jack Jackson and Dan Moss. The final integration of the 'pirates' and 'establishment' radio is largely considered to have occurred when the 'pirate's pirate', Radio Caroline rebel Johnnie Walker, joined Radio 1 in May 1969. In 1968 Radio Luxembourg changed its style, following the example set by Radio 1, and introduced all live shows with a new team of disc jockeys. 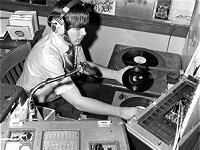 Eventually, on November 25th 1969, the UK government authorised licences for another 12 local radio stations and finally allowed a replacement for the services offered by the pirate operators, on a regional level, when licensed independent commercial radio stations began broadcasting in 1973. Despite being authorised to start local radio services, the BBC had no spare licence fee money to pay for it. The government and the BBC conceived a method of funding where the BBC would finance the setting up of the stations but local authorities would be 'encouraged' to meet the operational costs but without increasing local rates to pay for it. This rather limited the number of areas willing to cover the costs but, eventually, eight locations were selected to take part in this 'experiment': Radio Leicester, which began broadcasting on 8th November 1967 on 95.05 MHz VHF, RadioSheffield (88.6 and 95.05), Radio Merseyside (95.85), Radio Nottingham (94.8), Radio Brighton (88.1), Radio Stoke (94.6), Radio Leeds (94.6) and Radio Durham (96.8). Amazingly, Radios Leicester, Leeds and Nottingham only started with transmitters of 140 Watts, Radio Brighton had 75 Watts and Radio Sheffield a rather pitiful 30 Watt transmitter. Radios Merseyside, Durham and Stoke were comparative broadcasting giants, with 2.5 kW transmitters. Despite the low power these proved to be a success. There are a large number of facts and dates involved and to keep the work reasonably short they are presented in a kind of diary format. The history does tend to jump forward and back in time just a little bit in places, but only in an attempt to make the thing more readable and to give a better understanding of what was going on.In researching it, I certainly got quite confused a number of times about particular chains of events and have tried to solve that problem for you. Even so, it is still occasionally updated..... The list of Disc Jockeys is, I am sure, considerably larger than the one I have assembled. If you can help add to it I would be happy to get an e-mail from you, likewise any information about the offshore forts. Lastly, the history strays slightly either side of the Sixties. It seemed a shame not to document it from the start as it was so close to the Sixties, neither did it end in 1969 - Pirate Radio lives on! Historical facts, in themselves, are not subject to copyright but there are only so many ways of saying the same thing. I have tried to take particular care to present the events in my own words so as not to infringe, as far as I know, on anyone else's hard work or copyright. For the same reason, I reserve the copyright for ALL original text on these pages. If you want to reproduce any of it by whatever means, please ask first - I'll probably say yes - but it would be nice to know where it is going! I have no information regarding copyright contacts for any pictures appearing here - I have seen most of them in various locations with no copyright contact information. I am using them to illustrate the articles purely for interest and fan purposes with no intention of financial gain, but if I have upset anyone through their use, please advise me and I will either remove them or be only too pleased to give credit to the copyright owner if that is acceptable. Radio station names (I assume) and logos remain the copyright of the particular owners. Again, I only reproduce them for interest purposes and the same condition applies. To anyone who does hold copyrights on any of these and lets them stay on here, a very big THANK YOU! I would also like to pay tribute to the authors of the many excellent books and web sites I have looked at while putting this together as I can now appreciate, even if only to a small extent, the amount of work involved. I hope you get as much pleasure from reading it as I did in researching and assembling it.